On Tuesday 8th April, Manchester played host to “The Y Word – The Debate Continues” as part of the Manchester Jewish Museum’s Four Four Jew exhibition in association with Kick It Out. Hosted at the National Football Museum, in a city that is renown around the world for the football played there, with a panel including Roisin Wood (Director of Kick It Out), Alex Goldberg (Chair of the FA’s Football and Faith Group), David Conn (sports journalist for The Guardian), Anthony Clavene (sports writer) and Ivan Cohen (Professor at Richmond University), I could hardly control my excitement. As an ambassador for the Holocaust Educational Trust (and a huge football fan) this debate had a particularly important place in my heart. It was, and is, an important debate that needs to be addressed, not only in football but also in the wider community, so let’s have a little look into what sparked the debate and how “The Y Word Debate” continues. Let’s go back to last November, Spurs were playing a home game and three fans were arrested for anti-Semitic chanting. It’s common knowledge amongst football fans that Spurs supporters will often call themselves the “Yid Army” referring to Tottenham Hot Spurs history as being a Jewish team, with a Jewish board and successful Jewish history. Which was released to show how offensive the “Y Word” can actually be. Fast forward to March 2014 and the three fans were found not guilty of racial hatred as their chanting was found to have been said without any hateful intent and was sung in support of a football team, in a uniting fashion. It is from this that the question arose of whether it is racist to use the “Y word”. Is it racist to use if it’s used to show support for a football team? Is it racist at all? How can you determine if something is said with hatred? 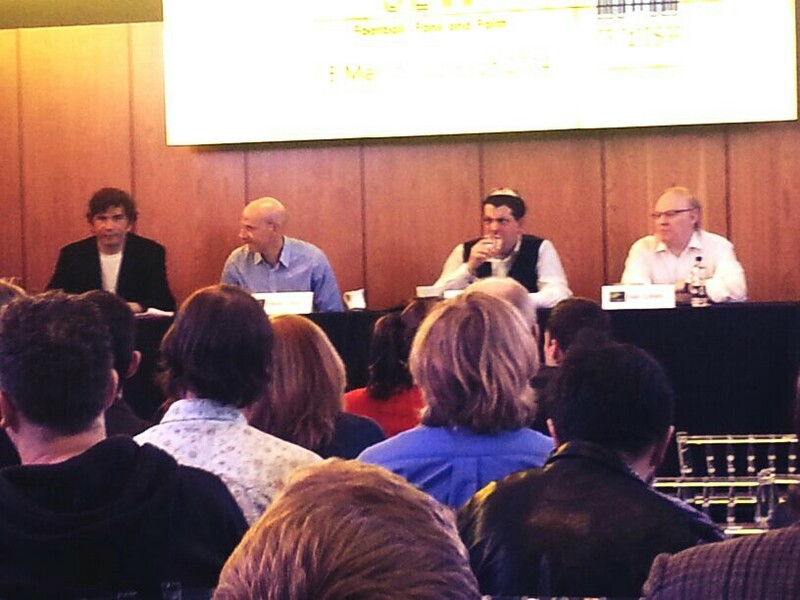 Clavene opened the debate by introducing himself, and his stance against the use of the “Y Word” not only by Spurs fans but in football as a whole. It must be said that all of the panel agreed, none of the Spurs fans should have been prosecuted and they disagreed with their arrest, however, as Anthony pointed out, this does mean that the word is inoffensive and should not be used at football matches. Clavene had been the victim of anti-Semitism throughout his life, with the “Y Word” being used in a derogatory and hateful way. He therefore saw the use of the word “Yid” as one fueled with racism, whether by Spurs fans in unity or not, he disagreed with the word being so freely used across football stadiums. He agreed that fans have every right to say it in the same way he has the right to be offended when fans run past him screaming “Yid Army”, he described the fear and discomfort it ensued in him – whether there was hatred intent or not. Another great point that Clavene made, was that 95% of Spurs fans aren’t Jewish. He therefore didn’t see why non-Jewish people would try and reclaim a word that they did not know the meaning of, nor understood in a racial or religious context to say in support of a football team. To him it didn’t seem just, and if anyone should reclaim the “Y word” it should be members of the Jewish community. Conn began by mentioning the “conspiracy of silence” that too many people had been putting up with the use of the “Y Word” in everyday life, when it needed to be talked about. And so he began his argument. Conversely, Conn stated it was all about intent to determine whether the “Y Word” was being said in an offensive manner suggesting he had a deeper argument to explain. “You’re getting gassed in the morning” whilst making hissing gas sounds (it gets worse but I won’t mention it here). So, from Conn’s point of view it’s this type of chanting (and so rightly) that needs to be cracked down on, rather than calling yourself a member of the “Yid Army”, despite the word having negative connotations in both instances. Conn made a point of stating that these chants were not on the same level as the racism black footballers faced in the 1980’s up to the modern day. He didn’t feel that the anti-Semitism faced in football is “real” anti-Semitism but more a quick fire way to try and hurt Spurs fans. He did not believe that either side of the coin really knows what it means to be a “Yid” and therefore the intent was harmless. As a member of the FA, Goldberg treaded somewhat carefully around the issues he was raising. He made it clear that the “Y Word” did not become an issue until the film was made and that the film coined the term and turned it into an issue. He agreed that targeting Spurs fans was targeting a wrong and easy target, where the real offenders are left unpunished. He said that Jewish people should use the “Y Word” as a badge of honour and no fans that are using it in an un-malicious way should be prosecuted. Yet, it was most interesting to see Goldberg’s response to whether this was just a London issue or was something that is seen across the world. He agreed, it is definitely not just a London point of controversy. It’s a problem that occurs not only across the UK, but also around Europe. He cited instances in France, Ukraine, Poland and so many more of where anti-Semitic chants are heard throughout football stadiums and grounds, in mainly malicious outrage. So, he concluded it is a great thing to have an open discussion about a topic that affects so many people in so many different countries, but whether the term “Yid” should be banned at Spurs games, is a completely different point. Cohen presented a very interesting case indeed. As a passionate Jewish Spurs fan, he took pride in calling himself a “Yid” and using the word “Yid” in everyday language. He felt comfortable in saying it and wanted it to be used in Spurs grounds, by Spurs supporters to provide them with unity. Cohen made the point that 95% of spurs fans probably don’t know what a “Yid” is, and it is therefore ridiculous to condemn them for using it (a point most of the panelists agreed with). But, it was Cohen’s references to living in a liberal democracy that shook the room the most. He said that every person has the right to be offended in the same way every person has the right to say what he or she wants. Indeed, his reasoning behind this was that no Spurs fan uses the term “Yid” in a malicious manner, and therefore members of the panel, Calvene in particular, can be uncomfortable and be offended because it is their right to, in the same way it’s a fans right to use the term (as long as it’s not done in a hate fueled manner). What the audience saw here was Cohen using the fact that Britain as a free democracy to support the fact that the term “Yid” should be used and in fact celebrated. Furthermore, Cohen made it clear that he felt away fans using Nazism as an insult deserved a punishment more than Spurs fans uniting under the term “Yid”. I think there was a general consensus in the room that more needed to done against fans shouting Nazi propaganda (intent irrelevant in these instances) due to the sheer meaning behind what they are saying. It was a point that the majority of people in the room supported. Being a part of the audience was almost as riveting as watching the debate. From the backbenches of the crowd I could hear the muttering responses to each of the panelists, particularly after watching the “Y Word” video. It soon became clear that there were too many points of objection to be made for the debate to run as smoothly as planned. Interestingly, the lawyer who represented the three Spurs fans that had been arrested was in the crowd and made the point that they weren’t using the term maliciously and therefore should not have been arrested, a point that the whole panel agreed with. However, tension rose when she disagreed with Jewish people being offended by the use of the word “Yid”. Indeed, Calvene stated that he was offended due to Oswald Moseley’s use of the word, when marching across East London telling Calvene and his family to get out of London, and that he had every right to be offended by the word, and she had every right to disagree. However, he argued she could not tell him not to be offended. Tension definitely increased in the room. Another point that was raised again by members of the audience was t that it was non-Jewish people that were reclaiming the words. Comparisons were made to the “N Word”, the “P Word” and queer, all words that have been reclaimed by subsequent members of society, whereas the “Y Word” was being reclaimed by a group of people separated from the roots and the meaning of Yiddish. An interesting debate seemed to circle on who should be saying it and how. The debate continued and discussed the impact of football on the Jewish community, and how, overall, football was used as a tool of unity and integration. It provided a platform for Jewish people to integrate into society, go to football matches with their neighbours and hug complete strangers at a match with no acknowledgement of their religion, colour or creed. 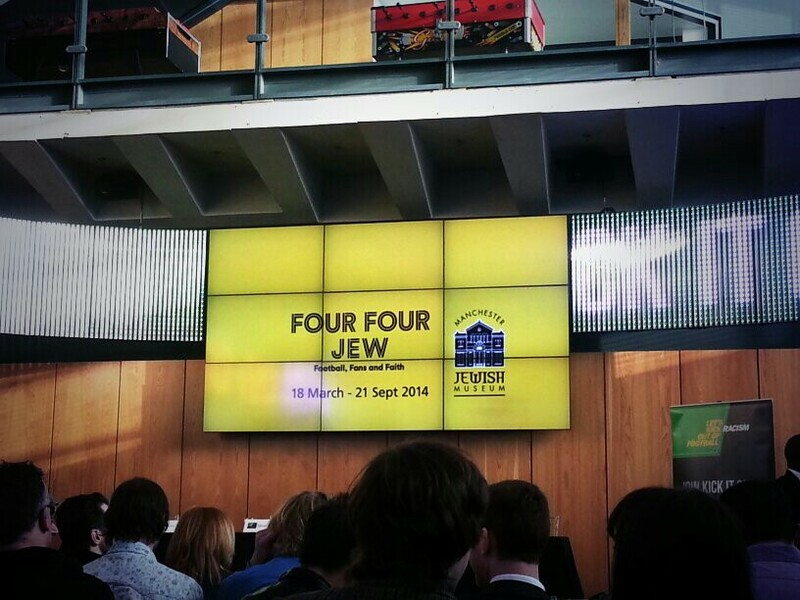 Go to the Manchester Jewish Museum to see the Four Four Jew exhibition. Next Next post: Why is Service Design Important?